dressed up like a lady: Wool. Michigan finally got its first real dose of frigid winter temperatures recently, with highs of something like 19°F/-8°C. Living in a region where winter means a truly biting chill presents its own set of challenges for dressing like anything but an Eskimo, as any fashion blogger or style conscious person who comes from the land of the ice and snow knows all too well. Generally speaking, I find that wearing a lot of wool is among the most effective (if obvious) ways to meet this challenge. 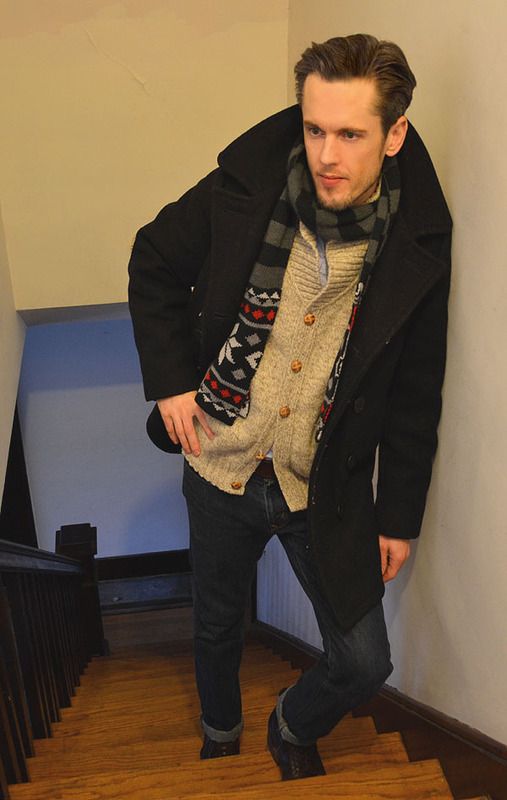 Having a range of stylish wool skirts or sweaters in your closet will take you far in a Midwest winter! You both look fantastic, darling! Wool skirts are how I survived three trips to Madison in the winter about four years ago. I do wish it would finally cool down a bit more here in Wichita. I have a long wool skirt I am dying to wear. I love that turtle neck! I've been looking for one, but they'll all too loose. I'll have to go check out Target. It is supposed to be 53 today in Chicago! I can't effing believe it. Just a couple days ago it was 9 degrees when I went to work. I am hoping to take advantage of the nice weather by taking pictures in the dress I won :). That is if I don't sleep the whole warm part of the day away (I work overnights). I love MC's whole outfit, however, I may be bias because it looks like he stole it from my boyfriend's closest, ha ha :). For some reason these pants made me think of you; I think because I'm sure you would rock them. They'd be better as flares though. you're hair is incredible, so brave and edgy. loving how you paired this longer skirt with the turtle-neck. I've lived in the Midwest my entire life, and still I have not mastered winter dress. I do have one wool sweater I like, but it's just so scratchy! Oh my... You make winters (my least favorite season) look like so much fun. I know I said it's pretty sunny out here in cali, but if I ever managed to look as good as you I would have snow every day!